Once upon a time there were two Decepticon leaders. One was officially Megatron, or as close to Megatron as Hasbro could get these days. The other was Apollyon, the third-party creation from X-Transbots. The $44.99 Hasbro Combiner Wars Megatron tried very hard to be the best Megatron he could be. He had a very Megatron-like head, for instance. And a very Megatron arm cannon. But bits of him were very un-Megatron-like. His backpack, for instance, was not very Megatron. ...original series fans crave a Megatron that changes into a much more portable sort of gun. Combiner Wars Megatron tried very hard, and got many things right. His transformation is simple yet satisfying. His robot mode cuts a striking figure. Hasbro even packaged him with Autobot stickers, for fans following along with IDW comic continuity, where the Decepticon leader has been trying something new. But we were just too far removed from a time when major toy companies could release a toy that transforms into a realistic gun. At least he tried. The $149.99 X-Transbots MX-I Apollyon, on loan for review from the fine folks at Toy Dojo, tried very hard to be the best Megatron he could be. He had a very Megatron-like head, for instance. 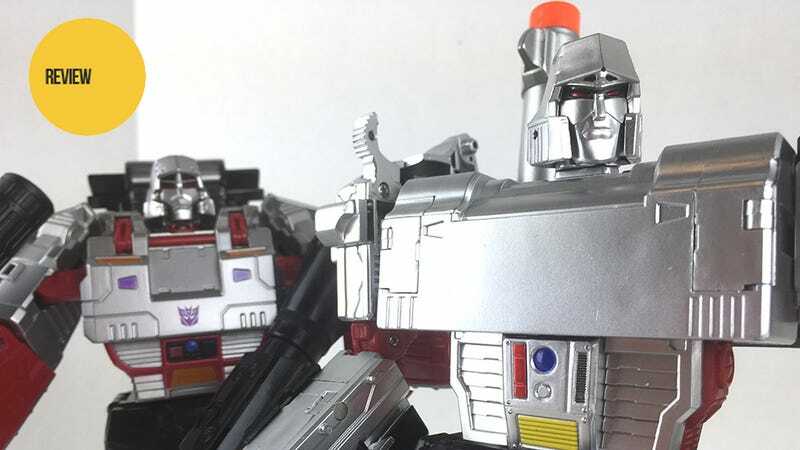 In fact, most parts of Apollyon were very Megatron-like, and while Hasbro’s own Megatron must resign himself to tank mode, the third-party Apollyon was completely free to be the gun you and me know Megatron to be. A giant-sized Walther PPK is what Apollyon would be, and by being that he deftly out-Megatron’d Megatron himself. Apollyon was massive and beautiful in gun mode, possibly even more impressive than in his nearly properly-transformed robot mode. Note that the review sample of Apollyon did not come with instructions, and the reviewer did his best. But Apollyon did not stop at just looking like Megatron. He gathered items that would remind fans of the fabled leader as well. Items such as a special key to something Vectorish and Sigma-like. A clone control helmet. A special chest panel depicting what he would look like if struck by an asteroid. An energy sword, in case one needed to stand while another fell. And a mace, for any dam-based combat that might arise. Does that pistol look familiar? It would if you were Hot Rod, Transformers’ biggest jerkoff. Apollyon packed up all of his Megatron things, crawled inside of a gorgeous box and waited until he officially started shipping, sometime next week. For all his ambition, Apollyon wasn’t without his faults. His transformation was insanely complicated, at points requiring the mightiest of fingernails or small tools to complete. An attempt to transformer him live on video resulted in much heavy breathing and cursing on the part of our reviewer. Being made up of many small, fragile-feeling tiny pieces, Apollyon wasn’t the sort of Megatron one takes to the park for a play date. He’s the sort of transforming robot one changes once or twice, picks a form and pose and then places on a shelf to lord over all the other motionless Decepticons. When all was said and done however, Apollyon wound up being a better Megatron than Hasbro Megatron, more faithful to the original Decepticon leader in both looks and complexity. Combiner Wars Megatron is a fine toy, but compared to Apollyon? He’s bad comedy. Once upon a time there were two Megatrons. One was quite good. The other was much better than that. A production sample of X-Transbots MX-I Apollyon was provided the reviewer by the folks at Toy Dojo. It has since be returned, glistening with drool.